Celebrity Select Dining is a new flexible dining option that allows you to choose when you dine on a day by day basis. You’ll still be seated in the ship’s main dining room, order from the same dinner menu, and enjoy the same amazing service that you’re accustomed to onboard Celebrity Cruises, but with more flexibility. Celebrity Select Dining debuts onboard Celebrity Equinox, beginning with the September 26, 2009 sailing. All other ships in the fleet will introduce the program during the first quarter of 2010. Historically, guests on most cruise lines decided at the time of booking whether they wanted early or late seating for dinner in the main dining room. Sometimes that meant rushing to dinner after a relaxing spa treatment or cutting that shopping trip short so that you could get back to your cabin to change for dinner. With this new program, plan your dinner around your daily activities. If you want to spend some extra time sightseeing in port, you’ll have the option to dine a little later that evening. Celebrity Select Dining is all about flexibility. You can choose to dine in the Main Dining room at any time between 6:00 and 9:30 pm each evening. If you wish, you can dine at different times throughout the cruise - the flexibility is yours. For those that like to plan in advance, make your day by day dining reservations online before your cruise. Celebrity Cruises recommends online reservations for the best possible dining experience. Reservations will be accepted onboard the ship also. • Pre-paid gratuities are required to participate — this includes tips for your waiter, assistant waiter, dining room management, and all stateroom service. *Celebrity Select DiningSM is subject to availability, and gratuities must be prepaid in order to participate. Only groups of 20 or less can be seated at one time. To make your reservations for Celebrity Select Dining, contact your travel agent or visit www.celebritycruises.com/celebrityselectdining. 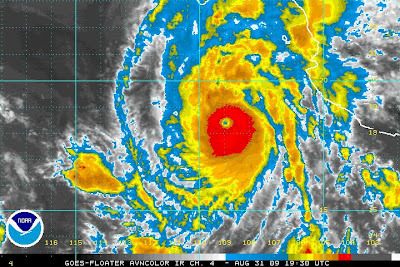 We continue to monitor this dangerous hurricane as it tracks toward Cabo San Lucas, Mexico and the surrounding area. Click on the following link for ongoing updates several times a day. Hurricane Hunter aircraft have flown through Hurricane Jimena and measured the current sustained maximum wind spead to be 150 MPH with higher gusts. It is very close to becoming a Category 5 (the highest designation on the Saffir-Simpson Scale ). JIMENA IS EXPECTED TO PRODUCE TOTAL RAIN ACCUMULATIONS OF 5 TO 10 INCHES OVER THE SOUTHERN HALF OF THE BAJA CALIFORNIA PENINSULA AND PORTIONS OF WESTERN MEXICO DURING THE NEXT 2 DAYS... WITH POSSIBLE ISOLATED MAXIMUM AMOUNTS OF 15 INCHES. A DANGEROUS STORM SURGE ALONG WITH BATTERING WAVES WILL PRODUCE SIGNIFICANT COASTAL FLOODING ALONG THE BAJA CALIFORNIA PENINSULA. The Carnival Elation August 29 departure from San Diego will visit Catalina on Tuesday and Ensenada on Wednesday. The Carnival Splendor August 30 departure from Long Beach will visit Catalina on Monday and Ensenada on Tuesday. Royal Caribbean's Mariner of the Seas August 30 departure sailed west to avoid the storm for the planned sea day, and will inform the passengers of additional changes later today as they continue to monitor the storm. In addition, NHC advisories are updated via RSS feed for both Jimena and Kevin (which has now become a tropical depression). Carnival Corporation announced that Carnival Fascination will undergo a multi-million-dollar renovation in January 2010 that will include the addition of a new water park, adults-only retreat, and resort-style main pool area, as well as 98 balconies added to existing ocean view staterooms. Two other ships, Carnival Ecstasy and Carnival Sensation are also receiving additional balconies during dry docks this year. Carnival Seansation's work has been completed and Carnival Ecstasy will have the work completed in October. The refurbishment includes a number of exciting open deck features, including Carnival WaterWorks with 82-foot-long racing slides, a splash zone and the aqua park's signature design element - a 300-foot-long Twister water slide. The main pool on Lido deck will also be transformed with oversized umbrellas, colorful tile work and thatched roofing, creating a relaxing, resort-style atmosphere. An adults-only retreat, Serenity, completes the outdoor improvements. The refurbishment will also include upgrades to the Sensation and Imagination main dining rooms, with the Sensation dining room being reconfigured for Your Time Dining. The majority of the additional balcony staterooms will be located aft with several of them featuring extended balconies. Twenty-four balconies will be located mid-ship and twelve near the stern. Several of the existing suites will be retrofitted with larger, extended balconies. Prior to the January dry dock, a new Circle “C” facility for 12- to 14-year-olds will be added on Atlantic Deck 8. The facility will include plasma screen TV’s displaying movies and music videos, a high-tech sound and light system, gaming consoles and a touch-screen jukebox. Carnival Fascination sails four and five day cruises from Jacksonville, Florida. These new enhancements will be introduced for the first time on the February 1, 2010 sailing. Reservations are open for the 98 new balcony staterooms, so contact me right away if this intersts you. Hurricane season got off to a slow start, but since Mid-August, there has been plenty of activity in both the Atlantic and Pacific. In the Atlantic, Tropical Storm Danny has now broken up, but in the Pacific, we have a tropical storm that has the potential for being a major hurricane. This post will track Jimena until it is no longer tracked by the NHC. We are closely monitoring the progress of Hurricane Jimena which is currently located about 250 miles southwest of Puerta Vallarta, Mexico. Additional information will be available later today. We will navigate our ships at a safe distance from the storm at all times. Rest assured, we will navigate our ships at a safe distance from the storm at all times. Our number one priority is the safety and comfort of our guests and crew. Mariner of the Seas which departed August 30th for Cabo San Lucas, Mazatlan, and Puerto Villarta is scheduled to be in the area of the hurricane later this week. The ship will sail west to avoid the storm and Monday will be a sea day as planned. Royal Caribbean will decide Monday afternoon whether or not to alter the ship's itinerary based on the latest weather forecast. Continue to monitor this post for updates on this cruise as well as the hurricane. 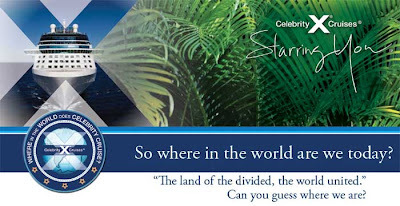 Yes folks, our next destination in our series on Where in the World does Celebrity Cruise in 2010/2011 is the Caribbean. You don't have to worry if you can't spare a whole week. Celebrity has short cruises to the Caribbean to accomodate your busy schedule! Escape from every day life not far from home. All you have to do is relax on your cruise vacation in the Caribbean. Choose from 4 to 7-night Western Caribbean cruise vacations. No matter when you want to go, or how long you want to cruise, a Celebrity Cruise ship can take you to somewhere in the Caribbean. I hope you noticed that all three of the Solstice-class ships will be deployed in the Caribbean. Having been on Celebrity Solstice for it's inaugural, I can confirm that she is a magnificent cruise ship - one that will exceed your expectations. Please submit your Group request here. Call me or email me requesting a flyer with more details about these cruises. Much of the focus the past week or so has been on the Tropical Storms in the Atlantic. That doesn't mean that the Pacific is exempt from tropical storms and hurricanes this time of year. We have been watching that area closely also, but fortunately, the storms that developed became disorganized before threatening any land or cruise ship interests. NOAA’s National Hurricane Center is now tracking the fourth named storm of the 2009 Atlantic Hurricane Season. We will also monitor this storm and provide updates including any cruise itinerary changes that become necessary. This storm has weakened significantly and we are not anticipating any itinerary changes at this time for the following cruise departures: Carnival Triumph departing from New York on August 29; and Carnival Pride departing from Baltimore on August 29. The Carnival Miracle cruise that departed from New York on August 28 will visit Nassau on Monday, Half Moon Cay on Tuesday and Grand Turk on Wednesday. We are closely monitoring the progress of Tropical Storm Danny. All of our ships are operating at a safe distance from the storm. Our number one priority is the safety and comfort of our guests and crew. We are not anticipating any itinerary changes at this time including the following cruise departures: Carnival Miracle from New York on August 28; Carnival Triumph departing from New York on August 29; and Carnival Pride departing from Baltimore on August 29. At this time, no Royal Caribbean International itineraries are being affected by Tropical Storm Danny. Royal Caribbean will continue to closely monitor weather conditions and will update this information again tomorrow, August 29 at noon. Explorer of the Seas is scheduled to depart on Saturday, August 29, for its five-night sailing to the Caribbean. Earlier this week, Tropical Storm Danny showed some signs of unpredictability. However, the most recent weather forecasts available predict that the ship will be able to depart Cape Liberty and head south to Bermuda as scheduled. Ships sailing from Baltimore, Maryland Grandeur of the Seas, is scheduled to depart on Thursday August 27, for its nine-night sailing to the Caribbean. However, guests on this sailing are encouraged to monitor these updates for any possible modifications to the itinerary. (Aug 26) Holland America: Regarding Tropical Storm Danny, we are closely monitoring the situation and will continue to watch the storm's development. ms Maasdam - Scheduled to turn in Boston on Saturday, August 29. No changes have been made to the published itineraries. NOTE: There have been no other advisories made at this time. Live Cruise Ship and Ocean Liner Tracking: <Interactive tracking map> See where ships are relative to tropical storms. Novia Scotia and Newfoundland are the latest areas that can now sigh a breath of relief and cleanup after the tropical storm leaves for open waters of the Northeastern Atlantic Ocean. The winds were strong causing tree branches to knock out power to thousands of customers in the Canadian provinces, but most of the power has been restored today. According to CBC News Canada, Ramona Jennex, the minister responsible for the Emergency Management Office, said "This was a huge storm and we were blessed that it missed us." Had the storm come closer to the coast, the story could be much different. Here are some Hurricane Bill Photos from Canada. The first Atlantic Tropical Storms have come late in the hurricane season this year, which often means they will be more powerful. Hurricane Bill was powerful indeed, but fortunately stayed offshore in Bermuda, the East Coast of the U.S., and the Atlantic Canadian Provinces. There is another storm brewing in the Pacific, Tropical Storm Hilda. As you can see, I've added a RSS feed for that storm. Should that storm become a hurricane and threaten Hawaii, and ships in the area, we will monitor that storm just like we did for Bill. Remember, cruise lines monitor the weather constantly and adjust their schedules to keep passengers and crew safe. There were only minor changes necessary during Hurricane Bill. As Hurricane Bill, now a Category One storm, continues its journey across the Atlantic, tropical storm and hurricane warnings and watches are posted and lifted as the danger passes. 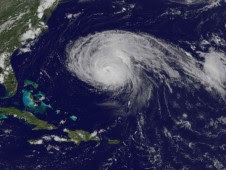 Bermuda and the East Coast of the United States are relieved as Hurricane Bill stayed offshore. Bermuda was the first to be spared a direct hit. There were high winds and rain with some damage, but considering the strength of Hurricane Bill earlier in the week, things could have been much worse. 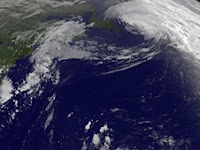 Residents of the East Coast of the United States had weekend plans at the beach foiled by the tropical storm, but again, except for some heavy rain and surf, Hurricane Bill didn't cause any real issues. Lifeguards in the area took drastic measures, closing beaches, to keep people safe from the swells and rip-currents which could be life-threatening if ignored. Hurricane Bill has weekened substantially and, according to NOAA forecasts, may even lose all tropical storm characteristics within the next 24 hours. That will be very good news indeed. Carnival Triumph cancelled its call in Saint John, New Brunswick, and will return to New York as scheduled on Monday. This change allowed the captain and crew to stay clear of Hurricane Bill and provide a safe cruise for the passengers. We will continue to provide updates (see above) until Hurricane Bill is only a memory. For those in the area of the tropical storm, stay safe by following guidance provided by local agencies. As a service to my clients and readers, I continue to monitor Hurricane Bill. If you are looking for updates on the hurricane and impact to your cruise, click the following link. That post has updates several times a day, including information about any changes to cruise itineraries as a result of the tropical storm. 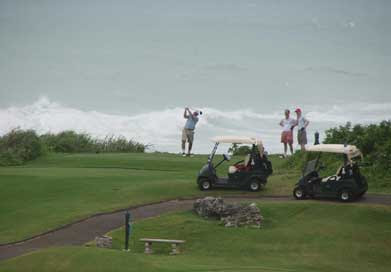 The islands of Bermuda were spared a direct hit as Hurricane Bill passed between Bermuda and the East Coast of the United States as predicted. Since Hurricane Bill's closest point is now northeast of the islands, the hurricane watch has ended. That doesn't mean that danger doesn't remain. A tropical storm watch is still in effect and should remain so as winds continue until around midday Saturday. High swells, dangerous surf and deadly rip-currents will continue well into the weekend, especially along South Shore. Hurricane force gusts are still possible early today in association with squally showers and thunderstorms. According to a source on the islands, it has been a windy night with numerous power outages caused by the tropical storm gusts. Bermuda's electric company has worked through the night but there are approximately 3800 customers still without power. Fortunately for the residents and tourists of Bermuda, Hurricane Bill will soon only be a memory as it continues its path northward towards the Atlantic Canada region and beyond. As power is restored, and the tropical storm continues to move away, services (such as ferry operations) will resume. For cruise passengers arriving Monday, on the Grandeur of the Seas, they should expect sun with some morning showers and temperatures in the upper 80s. The return home should be much smoother than the trip across to Bermuda. Happy cruising in calmer seas !! We have been tracking Hurricane Bill since Sunday and providing multiple updates each day. This is your one-stop source for cruise-related information and hurricane updates. Continue to monitor this post for updates. The best defense against a hurricane is to be prepared. This post will continue to focus on regular updates on the storm and impact to the cruise lines. In my post, Hurricane Bill / Current Tropical Storms , I have included a Be Prepared Checklist. A TROPICAL STORM WARNING MEANS THAT TROPICAL STORM CONDITIONS ARE EXPECTED SOMEWHERE WITHIN THE WARNING AREA WITHIN 24 HOURS. A HURRICANE WATCH MEANS THAT HURRICANE CONDITIONS ARE POSSIBLE WITHIN THE WATCH AREA...GENERALLY WITHIN 36 HOURS. These swells will likely cause extremely dangerous surf and life-threatening rip currents. Please consult statements issued by your local weather office. Note: These are the only Cruise lines with ships that were in potential danger from Hurricane Bill. Holland America, Princess Cruises, Cunard, Celebrity Cruises, though in the area, have no announcements. (Aug 21) The Carnival Triumph cruise that departed from New York on August 20 will cancel the scheduled call in Saint John. The ship will now navigate a safe course away from the storm and return to New York on Monday as scheduled. We are not anticipating changes to any other itineraries at this time including the Carnival Triumph cruise departing from New York on August 24. We will update this information if any new information is available. (Aug 19) For the Carnival Miracle cruise departing on August 20 from New York; and the Carnival Pride cruise departing on August 21 from Baltimore, we are not anticipating any changes to the itineraries for these cruises at this time. We will update this information if any new information becomes available. (Aug 21) Norwegian Spirit will depart Boston as scheduled August 21. Depending on the path of the storm, the ship may arrive later than scheduled into Bermuda. The ship's Captain will update the guests on board as to the specific arrival time in Bermuda once it has been determined. At this time, we are anticipating that the August 23 sailings of Norwegian Dawn from New York and Norwegian Majesty from Baltimore will depart as scheduled. (Aug 19) Norwegian Cruise Line announced the following itinerary changes: Because of the current path of Hurricane Bill which is forecasted to pass near Bermuda on Friday, August 21, Norwegian Dawn and Norwegian Majesty will depart Bermuda earlier than scheduled, leaving at 5 pm on Thursday, August 20. Explorer of the Seas, which departs Cape Liberty on Thursday, August 20, will sail a revised itinerary, with its ports of call simply reordered. The ship will visit San Juan, Puerto Rico, Sunday; Philipsburg, St. Maarten, Monday; Charlotte Amalie, St. Thomas, Tuesday; and Kings Wharf, Bermuda, Thursday. Grandeur of the Seas is scheduled to depart on Saturday, August 22, for its five-night sailing to Bermuda. However, guests on this sailing are encouraged to monitor these updates for any possible modifications to the itinerary. to bring you up-to-date information and help you be prepared for any impact to your cruise vacation in the area. The National Oceanic and Atmospheric Administration, NOAA is the prime resource for hurricane monitoring. Public advisories are published by the National Weather Service and the National Hurricane Center (NHC). Cruise Ship Tropical Storm Updates: <CARNIVAL> <Norwegian Cruise Line> <Royal Caribbean> Note: These are the only cruise lines affected by Hurricane Bill. Cruise lines will notify Travel Agencies and the public about any itinerary changes. Yes folks, our third destination in our series on Where in the World does Celebrity Cruise in 2010/2011 is the Panama Canal. Whether you are on the East Coast, West Coast or somewhere in between, you'll find a Panama Canal cruise that is sure to please. Select departure ports of Charleston, South Carolina, Miami, Florida, Fort Lauderdale, Florida, San Diego, California, Los Angeles, California, San Juan, Puerto Rico, or Seattle, Washington. These ports allow you to decide if you want to go Eastbound or Westbound on your Panama Canal voyage. The 48 miles of the Panama Canal will be very memorable. It's not often that the scenic route is also the shortcut. But that's exactly what you'll find on Celebrity's Panama Canal itineraries -- the shortest distance between the East and West coasts of the U.S. and some of the most scenic cruising anywhere in the world. This represents not just an opportunity to travel right through the heart of the rainforest, but to visit an exciting collection of ports on either side, including the Yucatán Peninsula, the Mexican Riviera, and cosmopolitan cities from San Diego, California to Miami, Florida. Call me or email me requesting more details about these cruises. Exclusive Royal Caribbean Sale ! Receive up to a $100 onboard credit per stateroom! Each stateroom booked will receive an onboard credit. Bookings on sailings 3-4 nights in length will receive a $25 onboard credit per stateroom. Bookings on sailings 5 - 8 nights in length will receive a $50 onboard credit per stateroom. Bookings on sailings 9 nights or longer in length will receive a $100 onboard credit per stateroom. Limit one onboard credit per stateroom paid in full. Offer is for new individual bookings only, not applicable to groups. Applicable bookings will receive one onboard value booklet. Limit one onboard value booklet per booking paid in full. Limit one dinner for two offer per stateroom paid in full. Applicable to Balcony and above. Please note not all ships feature both specialty restaurants. Spa Treatment offer valid through September 10, 2009. Spa Treatment offer excludes Oasis of the Seas, Majesty of the Seas, Grandeur of the Seas and Rhapsody of the Seas. Applicable to Balcony and above. Each stateroom will receive 1 spa treatment. Additional Terms and Conditions apply. Ask your Cruise Specialist for more details. 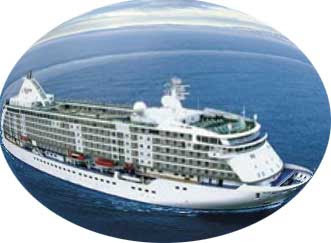 Regent Seven Seas Cruises takes you on a 119-night adventure from exotic locales to lands that transcend time. Discover the rarely visited, including west African treasures Ghana, The Gambia and Cape Verde. Explore the great cities, from Sydney to Singapore and Hong Kong to Shanghai. Each step of this magnificent voyage unfolds new ways of seeing the world aboard Seven Seas Voyager. Your world voyage begins with a Gala evening and overnight on board January 13th featuring Jay Leno and The Beach Boys. • Visas for U.S. and Canadian citizens residing in the U.S.
Complimentary events: In addition to the complimentary events on the individual segments, full World Cruise guests also enjoy an Ethnic Fashion Show at Three on the Bund in Shanghai on March 6, a Sunset Cocktail Reception on the Chao Praya River in Bangkok on March 20, and a Vintage Fair at Blaauwklippen Estate in Cape Town on April 15. Take advantage of the special offers by selecting your cabin for the Full World Cruise or One or More of the Segments before the offer expires on September 30th. This cruise will be an experience for you to remember for many years to come. Call me for complete details of the 119 night World Cruise which ends in Fort Lauderdale, FL on May 12, 2010. This blog post was renamed and republished keeping historical information. The original blog post, with continuous updates will remain on top of the blog as long as NHC continues to provide updates on the storm. We continue to monitor the progress of Hurricane Bill very closely as a service to our guests who are cruising in the area this week and next. This information is being shared with all so that you can remain informed on changes that might impact your travel plans. We are in the midst of Hurricane Season which officially began June 1st and continues through November. My previous blog article, Hurricane Season 2009 Begins Today, provided an initial forecast and various references to help you be prepared and stay informed during hurricane season. Fortunately, we have had a slow start to the season, but activity is starting to pick up in the Atlantic and Pacific Oceans in recent days. NOAA publishes revised reports throughout the season as new information is obtained. While the Atlantic has been calm since June 1st, all of a sudden there are three storms at once threatening the Eastern United States, Bermuda, and the Leeward Islands. According to its August Atlantic hurricane season outlook, NOAA now expects a near- to below-normal Atlantic hurricane season, as the calming effects of El Niño continue to develop. But scientists say the season’s quiet start does not guarantee quiet times ahead. I am a firm believer that we need to learn from history, or suffer the consequences. There have been other years that had a slow start to the hurricane season, but produced some of the most devastating storms, such as Hurricane Andrew. It is for that reason, that I urge you to continue monitoring tropical storm activity that might have an impact on your daily lives or vacation plans. At 500 PM EDT Sunday the center of Tropical Storm Claudette was located about 40 miles west-southwest of Apalachicola Florida and about 120 miles southeast of Pensacola Florida. At 500 PM AST Sunday the center of Tropical Depression Ana was located about 170 miles east of Dominica. At 500 PM AST Sunday the center of Tropical Storm Bill was located about 1440 miles east of the Lesser Antilles. Movement was toward the west-northwest near 16 MPH. Maximum sustained winds are near 65 MPH with higher gusts. Bill is expected to become a hurricane later tonight (Sunday) or tomorrow. At 200 PM PDT the center of Hurricane Guillermo was located about 995 miles east of Hilo Hawaii. Guillermo is expected to weaken to a Tropical Storm by tomorrow. UPDATE: 500 AM AST THU AUG 20 2009...BILL WEAKENS SLIGHTLY TO A CATEGORY THREE HURRICANE WITH WINDS OF 125 MPH...A HURRICANE OR TROPICAL STORM WATCH WILL LIKELY BE REQUIRED FOR BERMUDA LATER THIS MORNING. AT 11 AM AST...1500 UTC...THE BERMUDA WEATHER SERVICE HAS ISSUED A HURRICANE WATCH FOR BERMUDA. A HURRICANE WATCH MEANS THAT HURRICANE CONDITIONS ARE POSSIBLE WITHIN THE WATCH AREA...GENERALLY WITHIN 36 HOURS. UPDATE: 1100 PM AST THU AUG 20 2009... POWERFUL HURRICANE BILL REMAINS ON TRACK... THE CORE OF THE HURRICANE IS EXPECTED TO PASS BETWEEN BERMUDA AND THE EAST COAST OF THE UNITED STATES ON SATURDAY. UPDATE: 800 AM AST FRI AUG 21 2009... BILL BECOMES A LITTLE LESS ORGANIZED... MAXIMUM SUSTAINED WINDS HAVE DECREASED TO NEAR 115 MPH... SOME SLIGHT RESTRENGTHENING IS STILL POSSIBLE LATER TODAY FOLLOWED BY A GRADUAL WEAKENING ON SATURDAY. UPDATE: 1100 AM AST FRI AUG 21 2009... CATEGORY 3 HURRICANE BILL ON A STEADY NORTHWESTWARD TRACK... RAINBANDS ALREADY AFFECTING BERMUDA... EXPECTED TOTAL RAIN ACCUMULATIONS OF 1 TO 3 INCHES OVER BERMUDA... WITH MAXIMUM AMOUNTS OF 5 INCHES. EXPECTED TOTAL RAIN ACCUMULATIONS OF 1 TO 3 INCHES OVER BERMUDA... WITH MAXIMUM AMOUNTS OF 5 INCHES. A TROPICAL STORM WARNING IS IN EFFECT FOR THE COAST OF MASSACHUSETTS FROM WOODS HOLE TO SAGAMORE BEACH... INCLUDING THE ISLANDS OF MARTHAS VINEYARD AND NANTUCKET. A TROPICAL STORM WARNING IS STILL IN EFFECT FOR THE COAST OF MASSACHUSETTS FROM WOODS HOLE TO SAGAMORE BEACH... INCLUDING THE ISLANDS OF MARTHAS VINEYARD AND NANTUCKET. A TROPICAL STORM WARNING REMAINS IN EFFECT FOR NOVA SCOTIA ... A TROPICAL STORM WARNING IS STILL IN EFFECT FOR THE COAST OF MASSACHUSETTS FROM WOODS HOLE TO SAGAMORE BEACH... INCLUDING THE ISLANDS OF MARTHAS VINEYARD AND NANTUCKET. UPDATE: 1100 AM AST SUN AUG 23 2009... BILL MOVING NEAR NOVA SCOTIA... STILL A CATEGORY ONE STORM WITH MAXIMUM SUSTAINED WINDS NEAR 85 MPH... SOME WEAKENING IS FORECAST AND BILL IS LIKELY TO LOSE TROPICAL CHARACTERISTICS DURING THE NEXT 24 HOURS. UPDATE: 500 PM AST SUN AUG 23 2009...BILL NEAR EASTERN NOVA SCOTIA... HEADED FOR NEWFOUNDLAND...STILL A CATEGORY ONE STORM WITH MAXIMUM SUSTAINED WINDS NEAR 75 MPH... SOME WEAKENING IS FORECAST AND BILL IS LIKELY TO LOSE TROPICAL CHARACTERISTICS DURING THE NEXT 24 HOURS. If you are traveling on a cruise in the area, rest assured that the cruise lines number one objective is to keep passengers and crew safe. They also continue to monitor the storm and make decisions based on current information. Consult with your travel agent, the cruise line and watch for updates so that you are not surprised by any last minute changes. I wish you all safe travels.